It’s often said that a true friend will tell you if you have bad breath. 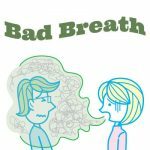 Bad breath, formally known as halitosis, is embarrassing and can hold you back from truly enjoying your life and social situations. Like a good friend, Dr. Joe Lee in Torrance will tell it to you straight. Read more below to determine what to do about your bad breath. Like all good friendships, quality time with your dentist is an important factor in your oral health success. A good relationship with your dentist, including visits at least twice a year, will help you avoid bad breath and many other oral health issues. Make an appointment with Dr. Joe Dentistry today to see us for a consultation or cleaning!